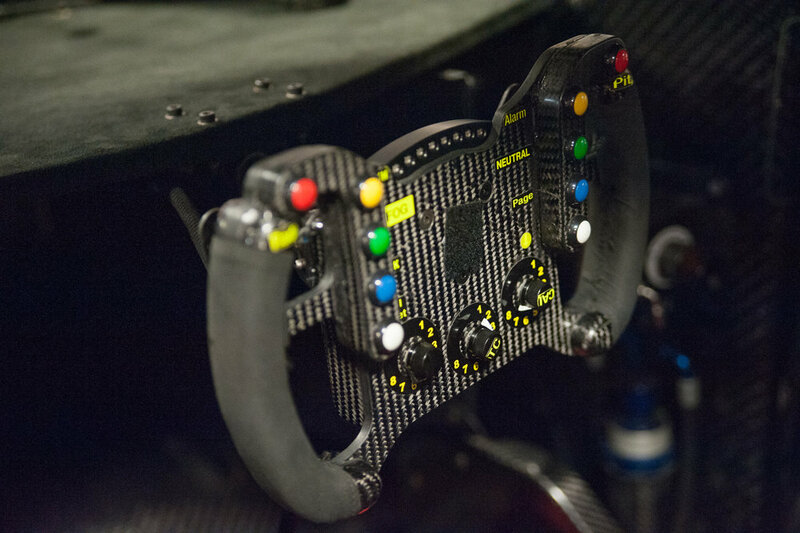 When you think of race car builders, you probably think of places like Maranello, Stuttgart, or even Charlotte. You don’t think of a town like Hoschton, Georgia, if you’ve even heard of it. Hoschton, however, is home to Panoz, a company that motorsport fanatics should definitely know. Just off a two lane road in the boonies, Panoz builds its own brand of performance cars for the street and track, with a storied history in IndyCar, Pirelli World Challenge, and at the 24 Hours of Le Mans. I was invited down to the Panoz factory and museum in Georgia to get a taste of the automaker’s history, as well as a glimpse at its future. As I stepped into the sunlit showroom, I was greeted by Panoz chief engineer John Leverett. He would be my guide through the museum, going over each car’s features, and recounting stories of races won and lost. The story starts in 1988, when Dan Panoz applied for a job at a small Irish carbuilder by the name of the Thompson Motor Company. That business would unfortunately go under shortly afterwards, but Dan used that as an opportunity, and bought the rights to the steel chassis that Thompson had been working on. Dan incorporated Panoz Auto Development in 1989, and in 1992, the Thompson chassis would be used to build its first car: the Panoz Roadster. Nowadays, when you have 10 different companies building kit Cobras, or LS-swapping Miatas, a lightweight V-8 powered roadster doesn’t seem that novel. Back in ‘92, however, Panoz was ahead of the curve. Much like the Shelby Cobra before it, the Roadster combined a light aluminum body with a Ford engine, two seats, and not much else. The Roadster’s 302 V-8 and T-5 manual gearbox were sourced from the contemporary Mustang. John Leverett tells me that the car rides on a live rear axle that they pulled from a Crown Victoria, and brake components re-purposed from the Mustang II. 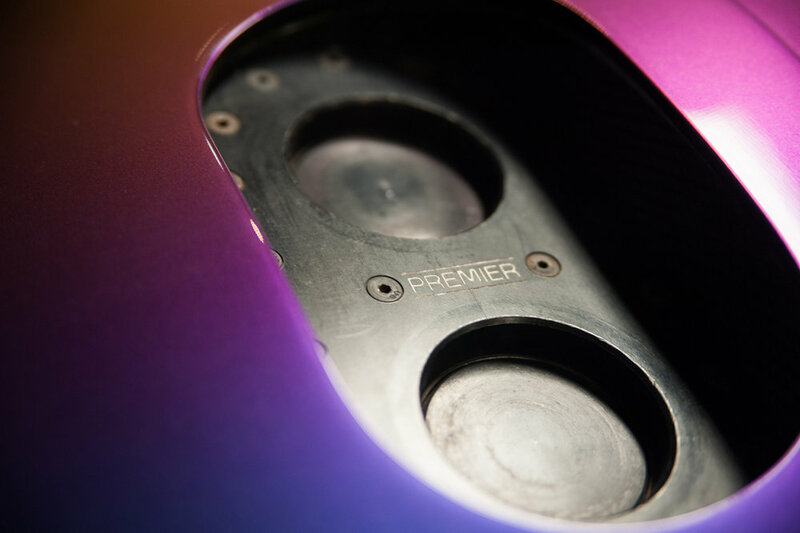 He also mentions that Panoz has retained the parts and tooling required to repair its old Roadsters, or build an entirely new one from scratch. 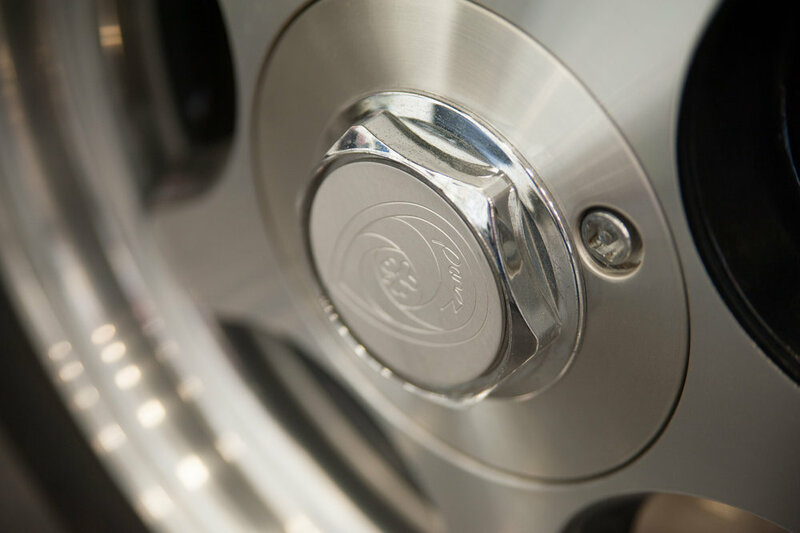 In 1996, the Roadster was updated with an all-aluminum chassis, and the new Ford 4.6 V-8. 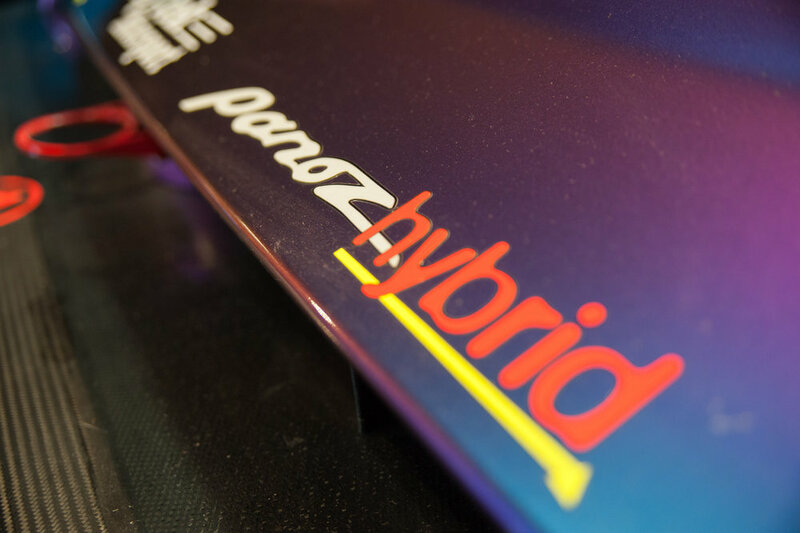 In 1997, Dan’s father Don Panoz had the idea of promoting the brand by getting it into racing, so he created the Panoz Motor Sport Group, whose very first product was the GTR-1 Le Mans GT1 car. The GTR-1 is powered by a Roush-sourced 6.0 liter V-8 mounted behind the front axle. According to the GT1 class homologation rules of that time, Panoz had to produce at least one road-legal copy of the car, and that vehicle currently sits in the showroom. Another variant of GTR-1, which John affectionately calls “Sparky,” came about in 1998. Sparky’s more technical name is the Q9, and it combined that Roush V-8 with an electric motor. The motor featured regenerative braking, and boosted the car’s total output to about 650 horsepower. This hybrid system was powered by a lump of heavy batteries placed inside the cabin, on the passenger side. While reliability issues would keep the Q9 from racing at Le Mans proper, it did later win the GT1 class during the 1998 Petit Le Mans at Road Atlanta. Despite the win, the project was soon after put on the shelf. Sparky may not have been very competitive at the time, but it did pave the way for the hybrid drivetrains that have become commonplace in the Formula 1 and Le Mans of today. As he shows me the car, John recalls a meeting he had with General Motors, when they told him that, “The American consumer would never accept the concept of an electric-gasoline car.” This meeting would’ve taken place about one year before Honda and Toyota began to sell their hybrids in the U.S. Succeeding the GTR-1 was Panoz’s LMP-1 “Spirit of America.” This car was entirely unique in the prototype class, as it had an engine mounted in front of the driver. Speaking of engines, this car also used the 6.0 Roush-Ford V-8. The LMP-1 has the distinction of winning the one-and-only Grand Prix of Washington DC in 2002. The race’s temporary course ran through the streets of the United States’ capital, and any future events were promptly cancelled after the city filed noise complaints. For a number of years, Panoz moonlit as a chassis supplier for Indy and Champ Car. One of the pieces in its collection is a car that driver Juan Pablo Montoya used to win the Indy 500 in 2000. This particular Indy Car was powered by the Oldsmobile Aurora V-8, which was a glorified Cadillac Northstar engine that’d been boosted by twin turbos to over 600 horsepower. In 2000, Panoz came out with a street-legal successor to the Roadster, the Esperante. Unlike the car before it, the Esperante was available in both roofless and roof-ed versions. It’s run by the Ford 4.6 dual overhead cam V-8 putting out 300 and change horsepower. In 2002, the Esperante got the added option of a 420 horse supercharged 4.6 from the SVT “Terminator” Cobra. According to John, those engines were so new at the time that Panoz practically had to beg Ford to get a hold of one for its test car. More recently, the Esperante has been given GM LS power, and is currently priced starting at $164,900. A racing version of the Esperante was also developed as an affordable way for private teams to race in the Le Mans GT2 class. John says the price for a complete race car was $79,000, which seems like a pretty good deal to me. The GT2 car combines a tube frame with easily replaceable plastic body panels. One of these Panoz cars won its class at the 24 Hours of Le Mans in 2006, a victory that John attributes to the car “not having any problems.” He also claims that the car set the GT2 record for greatest distance travelled during the 24 hours. My attention is then directed to what John calls the “notorious Deltawing.” Developed in conjuction with Nissan in 2012, the Deltawing was an experiment in aerodynamics gone too far. Taking the LMP-1 wedge shape to the extreme, it’s about twice as wide in the rear as it is in the front. The car’s front tires are less than a foot apart, and almost motorcycle thin, but the downforce generated by the Deltawing’s Concorde-esque shape was enough to keep it steady through the corners of Le Mans. Unfortunately, the car’s small size compared to those around it meant that it was often prone to getting run off the track. The Deltawing would go through many iterations in the coming years, none of them finding much success. John recalls the Deltawing’s run at the 2016 24 Hours of Daytona. Katherine Legge had driven the car into the lead, and maintained that position for 29 laps straight. Soon after Legge had swapped places with teammate Andy Meyrick, the driver slammed into a stalled black car that was practically invisible in the dead of night. That crash would put an end to the car’s run at Daytona, and the races that followed were plagued with numerous reliability issues. The book was closed on development of the Deltawing project after the 2016 season. In 2010, the Abruzzi “Spirit of Le Mans” was unveiled as Panoz’s next foray into building a road car. Foregoing the Ford modular V-8, the Abruzzi is powered by a supercharged LS3. 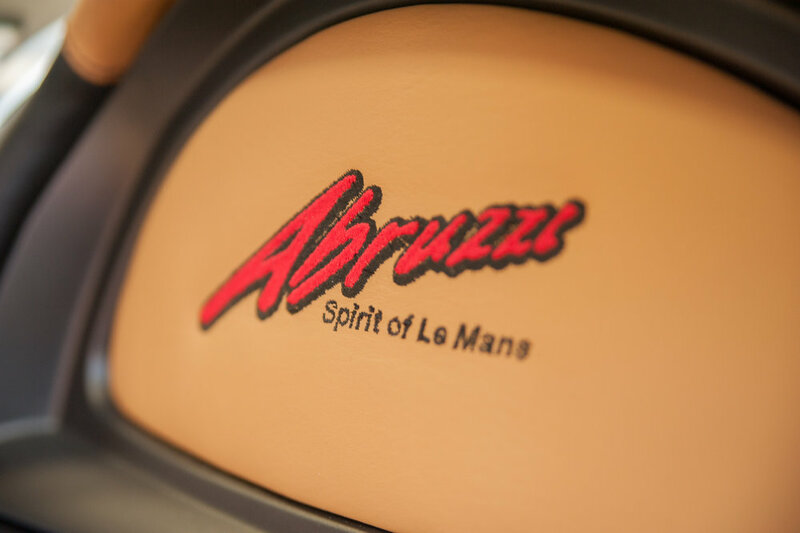 The company intended to build 81 copies of the model, and John tells me that the customers purchasing their Abruzzi would’ve been invited to Le Mans to experience their car on the track. For one reason or another, those 81 cars never came to fruition, and Panoz only ever built one street and one racing version of the Abruzzi. Both of these cars are currently in the museum. As of 2016, Panoz and its engine-building division Élan Motorsports, are subsidiaries of Green4U Technologies, another Don Panoz venture. The company currently produces the Surge, a small electric car that is legal for use on streets with a 35 mile per hour or lower speed limit. Marketed as “The Golf Cart, Grown Up,” The Surge is intended to be comfortable mode of transportation around neighborhoods and college campuses. Green4U is also developing a range of electric bus and SUV models to debut around 2019. Also in 2016, Panoz debuted its new Avezzano sports car. An update on the Esperante, it replaces that car’s aluminum body panels with ones woven from carbon fiber. The new car weighs in at 3,200 pounds, about 150 lighter than the Esperante. It also differs from the old model by the addition of an integrated roll cage, and fastback roof design. The car comes with a 430 horsepower LS3 standard, which can be bumped up to 560 with the addition of a supercharger. John also says that customers can option out the car with a Coyote 5.0 if their pockets are deep enough. Base price for the Avezzano is $159,900. Most recently, Panoz has been racing the Avezzano in the Pirelli World Challenge series, competing against the like of McLaren, Porsche, and Lamborghini. It’s doing pretty well, judging by the dozens of trophies that occupy a wall in the museum. The car is currently running in the 2018 season, and as of this writing, Panoz driver Ian James is ranked 5th of 79 in his class. What’s the next step for Panoz? The answer to that could lie in the GT-EV concept that it’s shown off as a cross-promotion with Green4U. The theoretical GT-EV is a completely electric Le Mans race car capable of doing 180 miles per hour, with a 90 to 110 mile range. The EV would also have an easily removable battery pack that could be quickly changed during race pit stops. To go along with the race car Panoz has drawn up a street version that would have two seats, one mounted in front of the other. Between V-8 powered coupes, and entirely electric concepts, it’s uncertain what direction Panoz will take. Either way, I hope it continues to be a small automaker out in the sticks that knows how to punch above its weight class. Note: My visit to Panoz, and much of this article’s writing, took place before the unfortunate passing of Don Panoz in September of 2018. Since his death, the company has announced that it would undergo an “organizational restructure.” The biggest change to the automaker so far is that it has re-branded its Deltawing division as “Panoz Manufacturing.” Resources previously dedicated to Deltawing will presumably be put towards the company’s future racing projects.